Sanitizing is probably the most important step in brewing beer. This goes for professional and home brewers alike. Of course before sanitizing, equipment must be cleaned, removing visible filth, film and dust. This can be done the same way dishes are hand washed. Avoid abrasive cleaners and pads because these will scratch plastic surfaces leaving an abode for bacteria. Sanitizing is different from cleaning, and it requires the use of chlorine or iodine mixed with water to kill any remaining bacteria. 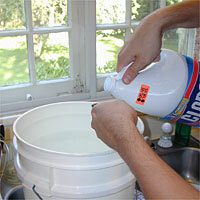 Bleach may be used (2 ounces per 5 gallons of water) or pure iodine may be used (1 ounce per 5 gallons of water). The sink can be used to hold the sanitizing solution. 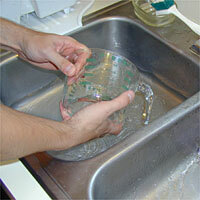 If possible, allow the equipment to soak for a few minutes before rinsing it with clean cold water. Store the equipment in a sanitized location such as a sanitized dish drainer to dry. The area should be free of too much air movement and dust because bacteria can travel in this manner. At this point you may elect to measure out three gallons of clean cold water and add it to your sanitized and rinsed fermenter. The fermenter will not be used for another hour or two, but filling it and sealing it now will protect it from unwanted contaminants while you are cooking the wort. When it is time to use the fermenter, it can then be opened again. 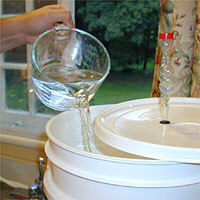 In this picture the sanitized air lock has been filled a third of the way with water and inserted in the lid.